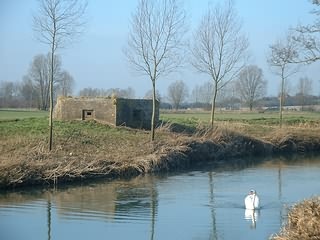 North of Bures to Sudbury, alongside the River Stour, all of the Pill Boxes have been built on the Essex side of the river. They are hexagonal in shape with a roof gun emplacement. On the flat roof, there is a central anti-aircraft machine-gun well with concrete mounting pedestal but no fittings. There are two 15 long steel rails with the well between them concreted at each end into the roof. These are suspended three or four inches above the roof and it may be that these acted as runners for a pair of well covers. 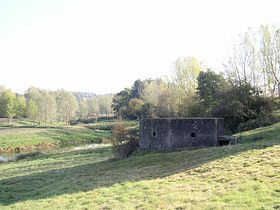 Pill Boxes appear to be approx 350 - 550 yds apart, from pillbox No5 you can see 2 boxes to the North and 3 more to the south. This makes a total of 6 boxes in view from one location. 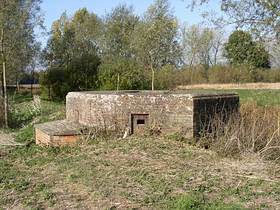 On the W bank of the R. Stour just N of Bures is an hexagonal, brick and concrete pillbox. The brickwork is falling off the outer walls and the concrete beneath is deteriorating, showing the reinforcements. 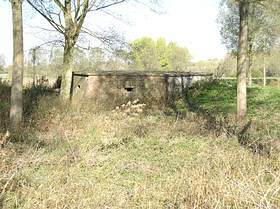 The pillbox is 22 across, has 311 thick walls and the semi-sunken entrance is on the W face. 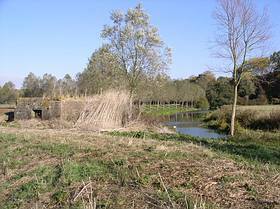 PillBox Standing on the W bank of the R Stour, in a willow plantation, is an hexagonal, brick and concrete, pillbox. It has a central anti-aircraft machine-gun well with a concrete mounting pedestal, although the steel fittings are missing. Somewhere under all this ivy ? 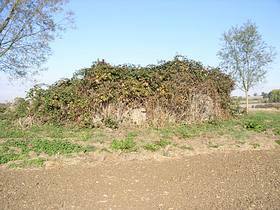 PillBox On a grassy bank overlooking the R Stour 25 yards away, is an hexagonal, concrete pillbox. It is 165 wide with an L-shaped, low entrance on the SSW side. Unusually, the walls are just 14 thick the normal minimum being 15. On the roof there is an anti-aircraft machine-gun well with a concrete mounting pedestal but no steel fittings. 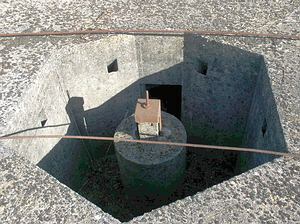 Concreted into the roof, with the well between them, are two long steel rails. It is possible that these were used for well covers the covers being slid back along the rails. Inside, steel shelf brackets still remain in situ. 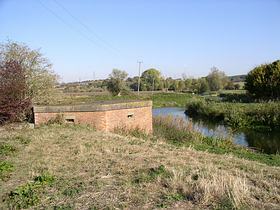 PillBox On the bank of the R Stour is an hexagonal, brick-faced, concrete pillbox. It measures 2110 across with a low entrance on the W side. This is a central anti-aircraft machine-gun well with concrete mounting pedestal and remains of the steel fittings. Two steel rods cross the roof although one of these has become detached and is bent. 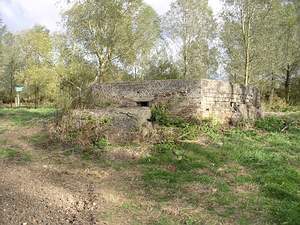 Unlike its neighbour 300 yards to the S, which has unusually thin walls, this pillbox has unusually thick walls fully 311.